It’s been a long 2 years, but we survived life without a fully functioning powder room. I am so happy to have the room finally finished and ready to use! If you have been following along, you know that we started this remodel some time ago. I ripped out an old vanity shortly after moving into our house, with the intent of fixing the room up a lot earlier than we did, but other home projects took precedence. The previous french inspired vanity in the room was beautiful, just too ornate for our taste. While some french inspired styles are often perceived as ostentatious, true french country style showcases elegant simplicity. I designed our powder room with this style in mind, thinking simplistic elegance and adding a modern twist. You can catch up on all the details of the renovation and design changes here. 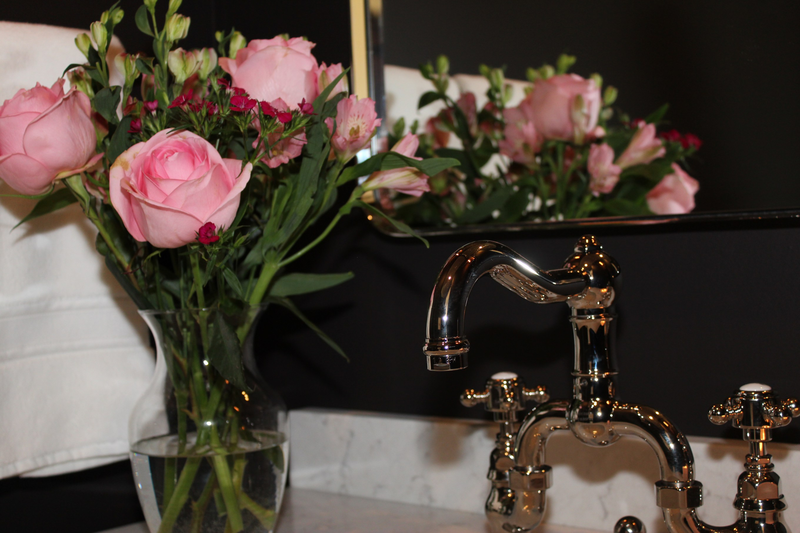 Let’s take a peek inside the NEWLY remodeled powder room. We relocated the plumbing and junction boxes for sconces, to an adjacent wall in the room. The vanity fits and looks much better in the new space. My favorite aspect about the room are the black walls. The color is Obsidian, it’s a Restoration Hardware color but we used Benjamin Moore Aura interior paint. I am in love with the look of “old faucets” with cross handles. This satin nickel country bath faucet HERE has the exact look and feel I want. The quality, heft, and look of this faucet make it a clear winner in style and function for the space. I must confess, it is on the expensive side, but clearly worth the cost when I compare the superior quality to other faucets. In keeping with a similar look and feel to the faucet, I chose a towel bar HERE from the same family. I went with a 18″ towel bar instead of a towel ring. I felt that having a bar located directly next to the sink gives the space a more modern feel. The sconces are from Restoration Hardware. These sconces give off a beautiful glow in the room. When the overhead light is off and only the scones are on, the room feels magical. It’s hard to convey that feeling in pictures, but the glow against the black walls is stunning. The mirror is from Restoration Hardware as well. You can find a similar one HERE, HERE and HERE. The style of the room incorporates modern sleek design like a nickel framed mirror with a weathered vanity and country bath fixtures. The countertop is made of quartz. It is nonporous, scratch and stain resistant. It has gray veining with a sleek white background. The round sink is a ceramic bowl. French Country style incorporates weathered furniture. The weathered oak washstand is also from Restoration Hardware, similar one HERE. The exposed pipes and open shelves give the space a rustic yet refined feel. The white wire basket, used to store toilet paper is from Home Goods, similar HERE. The decorative crown molding and ceiling were painted “Right White” using Benjamin Moore Aura paint. Aura paint is the top of the line paint at BM, and the most expensive. Personally, I like Benjamin Moore Regal Select paint better than the Aura paint. The Aura paint dries quickly and can leave brush strokes on the wall if not caught in time. Our new toilet is a Kohler. I have the hardest time trying to decide on new toilets. I ended up with a simple 2 piece toilet, on the less expensive side HERE. Initially I ordered a $900 fancy toilet, which got lost during shipping. It was eventually found and returned to the seller. But I decided to put the extra money I would have spent on a toilet, towards finishes, like the faucet, towel bar, and toilet roll holder. I did splurge a bit on the toilet paper holder HERE. I love the unique design and weight of this holder. It also coordinates with the towel bar and faucet. And I love the lift up bar to easily replace rolls when needed. I don’t have the patience for those spring toilet roll holders…they just annoy me. Thank you so much to all who participated in my Instagram Story poll, you helped me to decide where to place the holder, 75% responded on the left, which is what we did. Lastly, a couple accessories from Home Goods, a candle and soap bottle complete the look. Thank you for following along on our remodel. The goal was to design a room with simplistic elegance, I hope you like our modern french country powder room. For more remodeling posts and decor inspiration, subscribe to Happy Haute Home and follow along on Pinterest HERE, and Twitter HERE and feel free to pin and tweet your favorite pics from Happy Haute Home. Oh Denise it’s beautiful I love it.. You’ve done a wonderful job. The colour is amazing ..
Hi Denise! Thank you, I really appreciate that, yes the color turned out beautifully! Just lovely – simple, stylish and elegant! Nicely done Denise! Simply elegant! i liked the ‘before’ better. HAA!!! Kidding. Hmm..I think it’s a romantic nuance you got there in your powder room, lovely!